True to his word, Andy V. had his friend shoot photos of his Hassmer. I received them this morning. whereas Andy's has the texture of an orange. 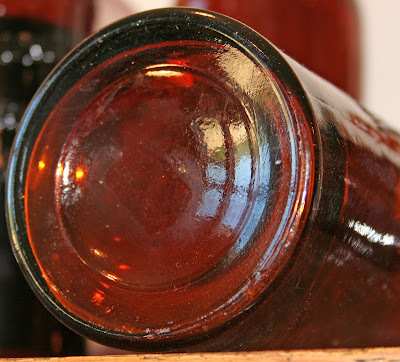 One thing is for sure though; whomever applied the tops on both sure didn't skimp on the amount of glass used. Take a look at that spillover! Andy V. mentioned the possibility of an oddball Hassmer variant with either a sticky ball or graphite pontil scar on the base. His comment got me curious. As I mentioned before, it's obvious that both the tooled and applied top examples in my collection originated in the same mold. The font, spacing, etc. etc. etc. are identical when compared with photo overlays and caliper measurements. The mold was modified to improve the finished product by the addition of a couple of air vents on the reverse shoulder, but that's the only thing I noticed. Until Andy mentioned the base on his. Although the bases proper on my two are identical, a mold number was added when the venting was done as the glassworks transitioned from glop to tool tops. I sure w ould like to see a photo of Andy's. The cause or the cure? I did a display with that title many years ago. It was kind of a what came first, the chicken or the egg, quandary dealing with western whiskies and bitters. 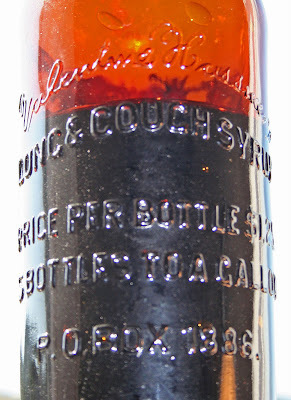 Most, if not nearly all, west coast liquor wholesalers had both a bitters and a "hard beverage" lineup of products. 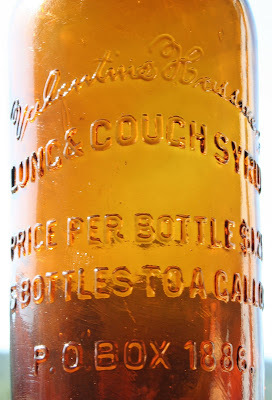 I used to enjoy thumbing through Bill & Betty Wilsons books on both bitters and whiskies and actually built up a pretty respectable collection of matching bitters and whiskies by company. I've since sold off all but a couple western bitters, and have instead focused on western whiskies, primarily cylinders. Some time ago, I had the opportunity to add a glop top cylinder to my collection. It is without question, one of the crudest and rudest globbies I've got. 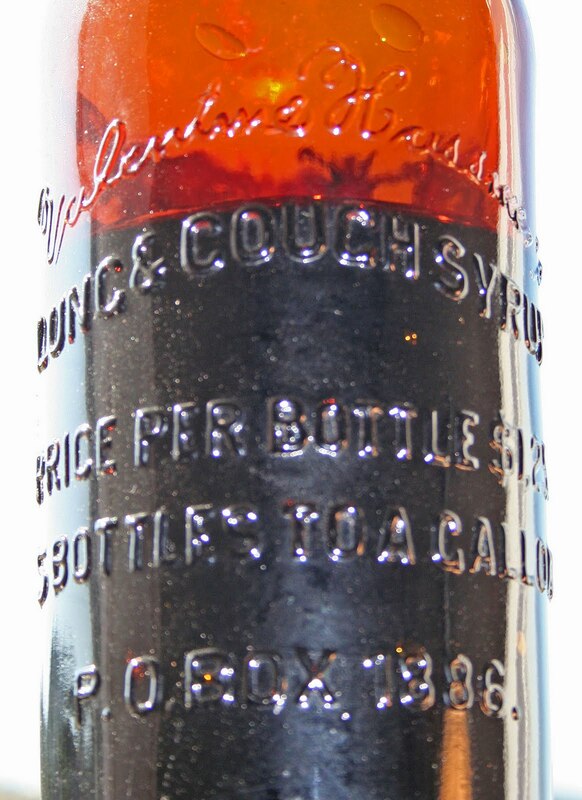 It's embossed in grand full face style; "Valentine Hassmer's / Lung & Cough Syrup / Price Per Bottle $1.25 / Five Bottles To A Gallon / P. O. Box 1886". No city or state listed in the embossing, but the crooked right leg on the "R"s left nothing to the imagination. And the style of the glop top, along with the color of the glass cinched it for me. It had to be from San Francisco. And so it sat, flanked on one side by a McKennas and the other by a Hilbert Brothers. As so often happens, I stumbled across another, only this time tooled, but yet blown in ta very similar mold. Hmm, another "crossover". It's a bit more neatly made, no doubt because of the addition of two funky looking air vents located on the rear shoulder, with nowhere near the character of the glop. But it has two important features that the globby doesn't; label and contents. 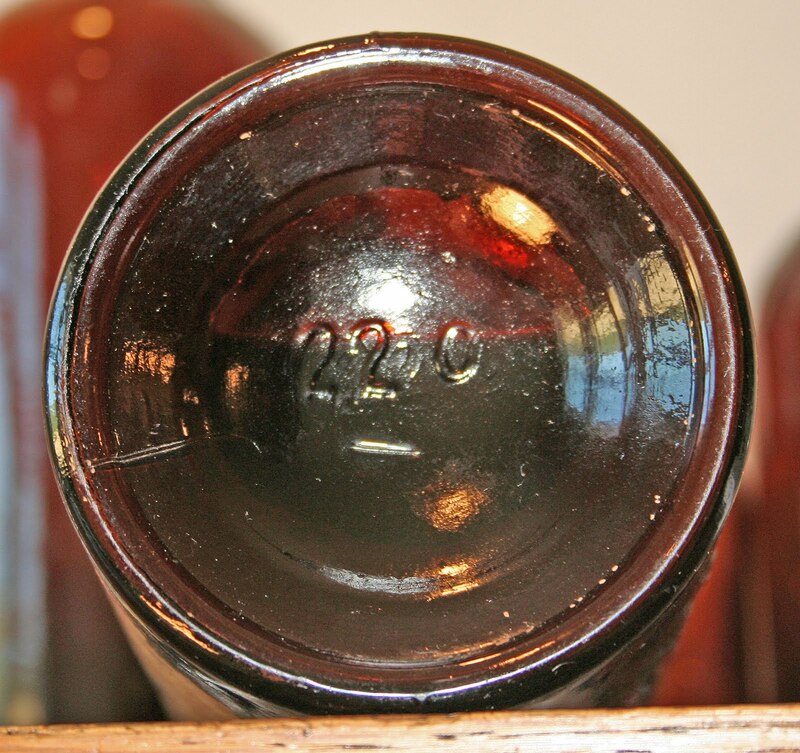 The label, like a picture, is worth a thousand words. First off, the price embossed on the front is the same as on the glop top, but the label states, "Price per bottle $1.00". It also decrees that the company was now incorporated, and shows the physical address as 933 Washington St. It states that the tar black stuff inside was "For all diseases of the Throat, Lung and Catarrh Fevers" and that "It will cure Consumption". It goes on to give dosing as a wineglass three times a day - but the patient may increase the number of doses a day at will (Geez, ya think?). 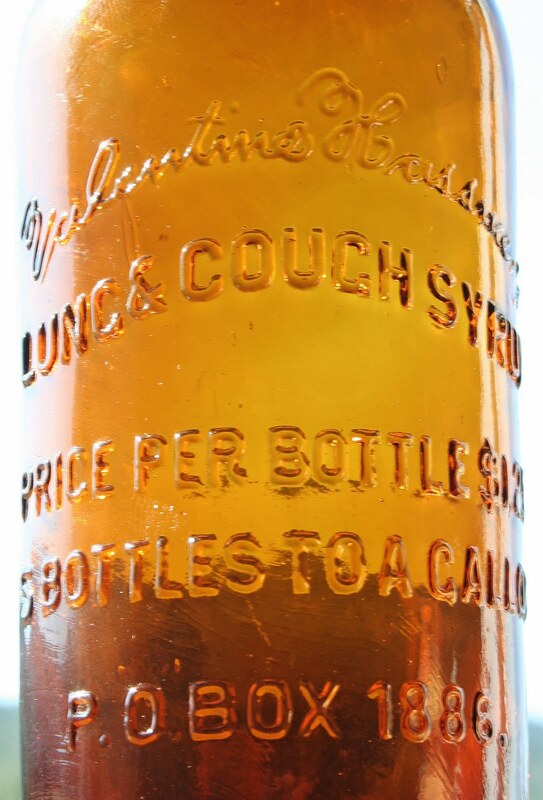 Armed with the information on the label, I did some snooping around the "musty halls of history" and found out that Valentine Hassmer made his debut in San Francisco in 1873 as a "grocer, provisioner and liquor dealer". He located at the corner of Washington and Powell (which is actually 933 Washington as listed on the label). From what I could surmise, he also made his home here, as was often customary, because no residence is listed separately. In 1876, he is listed as dealing in groceries and liquor. 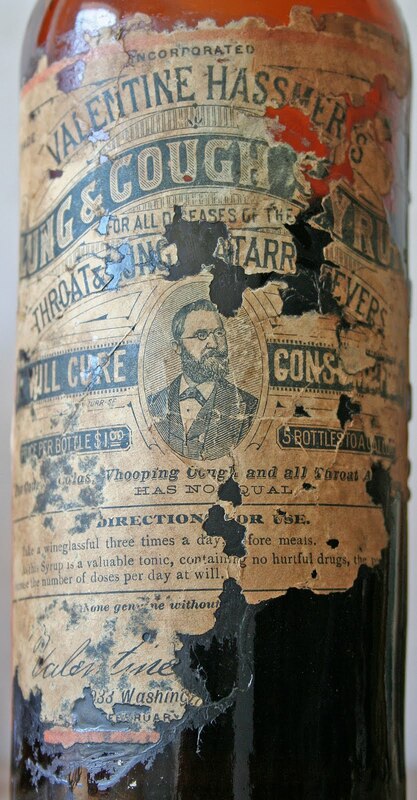 This listing remains the same until 1880, when he is listed as dealing in lung and cough syrup, still at the same address. Everything remained status quo for the next 22 years, until October 21, 1902, when the business and building was offered for sale. Looks like he stretched the truth a bit when he claimed established 1864.That or the almanacs failed to note his presence. The last advertisement for the business appeared in the November 28, 1902 edition of the San Francisco Call. Valentine Hassmer disappeared from the radar for good after the publication of the Crocker Langley business directory in 1904.